Should you start a low carb diet? Just like any diet, a low carb diet is not for everybody. Sure, it has many health benefits but not everyone will do well with it. Starting a low carb diet is a lifestyle change. You need to prepare for before what’s ahead. Make sure you know how a low carb diet affects your body, and know how to navigate it in a healthy way. Insulin regulates the blood sugar levels in the body. It also plays a role in the storage of macro-nutrients. Carbohydrates stimulate insulin production which in excess can also be harmful to your body. Excess in insulin production may result in high glycemic levels, high blood pressure, and puts you at risk for type 2 diabetes, heart diseases, obesity, and cancer. A low carb diet helps the body regulate its insulin production to normal levels. Those who are suffering from joint pains can benefit from following a low carb diet. A high carb diet precipitates inflammation. An increase in insulin levels has been found to have a correlation with C-reactive protein, the body’s primary marker of inflammation. To have more energy, you have to take care of your health at a cellular level. Another side effect of high levels of insulin is that it damages your mitochondrial health. Caloric restriction increases oxygen efficiency and reduces oxidative stress byproducts in the mitochondria. 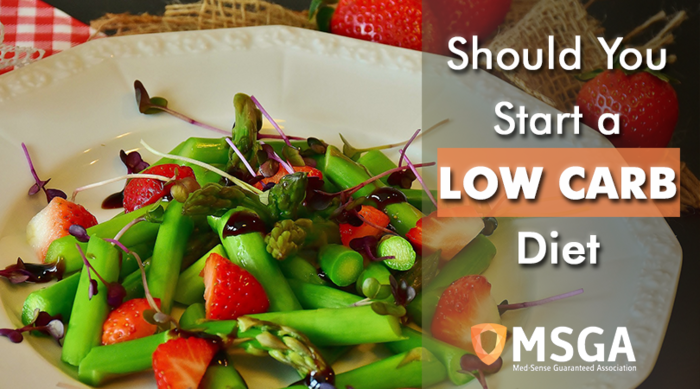 Going on a low carb-diet improves your mitochondrial function and increases its longevity. Going on a low-carb diet entails a lot of commitment and discipline. A lot of the food that is readily available is loaded with carbs. Unless you have a personal chef, meal prepping might be something that you need to allow some time for. You will also need to re-learn the way you cook to eliminate certain ingredients and give way to new ones. A low carb diet can be restrictive. As a result, nutrient deficiency is something you need to consciously avoid. When shopping for your meals, make sure to include more varied foods. Shop with this in mind by putting new colors into your shopping cart. Aside from the usual carrots and celery, include whole foods that are purple, yellow, red, etc. Doing this will add more excitement to your meals and will help you avoid various nutritional deficiencies. Start slow. Your current diet will determine how well you will fare in a low carb diet. If your typical meal heavily consists of carbs, cutting down carbs in one go may lead to a bad case of the Keto Flu. A Keto flu is a condition where you may feel sluggish, depressed, and even anxious following a low carb diet. Gradually swap your high carb food to low carb, high fiber options. For example, instead of cereal for breakfast, make some eggs and high fiber toast. You should also make sure that you are drinking a lot of water. Say no to processed food that contains carbs that cause inflammation and a lot of sugar. On food labels, look for the amount of added sugar under “total carbohydrates”. Those are the carbs that you need to eliminate from your diet. Fill up on fiber. Green leafy and cruciferous vegetables are great sources of fiber. They is also your healthy carb options. Include at least two cups of vegetables in your diet every day to stay full without loading up on unhealthy carbs.